VERTEX is proud to support the South Shore Health System Foundation. Benjamin Strong, COO and Jeffrey Picard, President, are active members of the South Shore Health System’s Presidents’ Circle. South Shore Health System (formerly, South Shore Health and Educational Corporation) is a not-for-profit, tax-exempt, charitable Health System that provides a broad range of health services to the 620,000 residents of Southeastern Massachusetts. 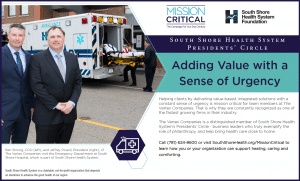 Learn more about the South Shore Health System organization and how VERTEX Gives Back to our community.